Mixing textures keep neutrals from looking flat. Great shapes and architectural detail get noticed in a neutral color palette and they can really bring a room to life. 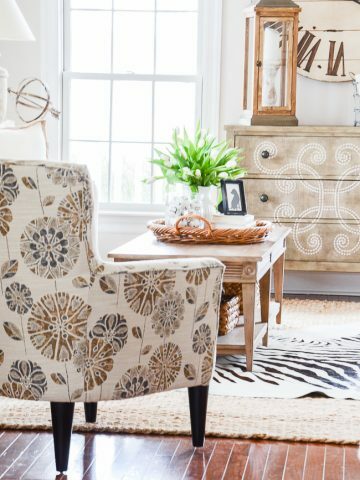 Opt for interesting shapes when choosing case pieces, chairs, and carpets. 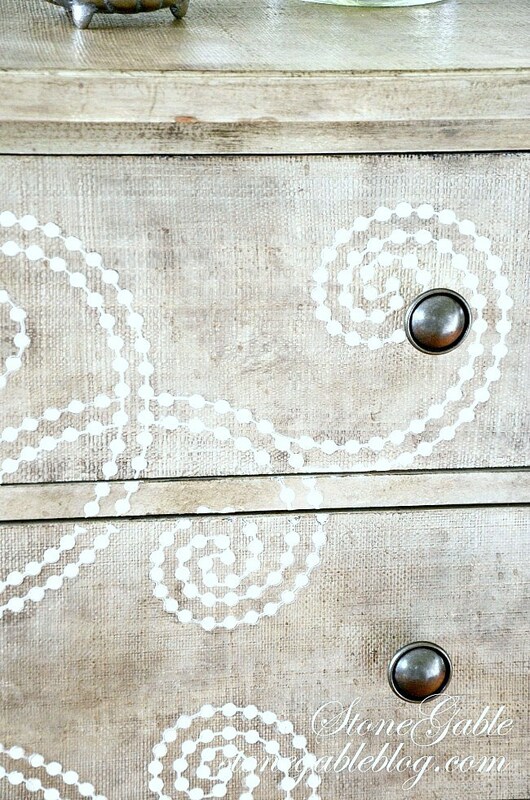 Pick great details like carved wood or fun patterns. Don’t get sucked into all white decor or your room just might look like a painter was let loose with a spray gun full of “painter’s grade white” paint! WAY TOO BORING! 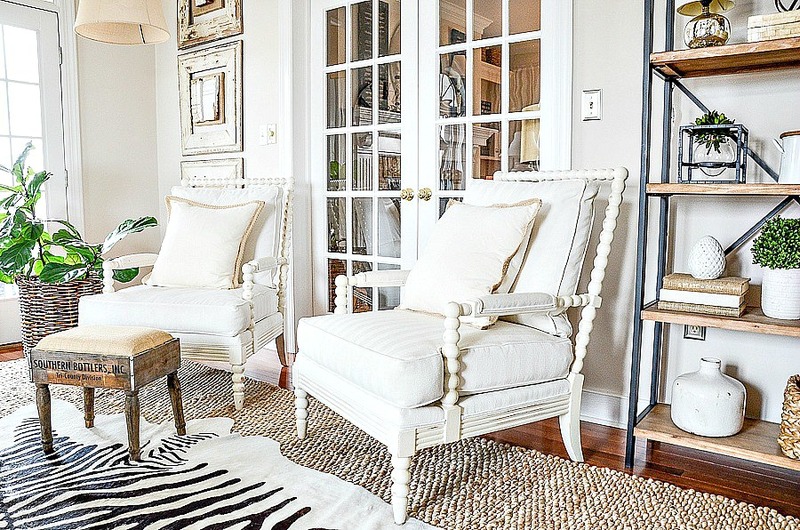 White done right has lots of varied and subtle neutral hues. 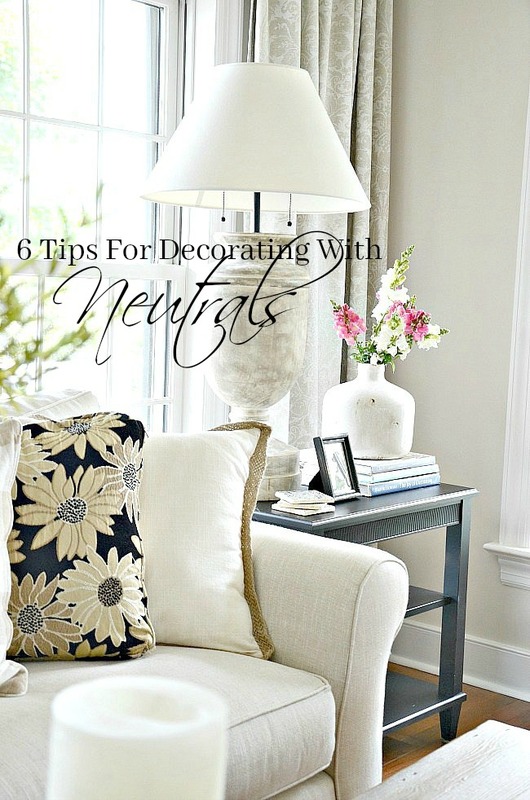 It’s amazing to see just how many different colors and hues go into great neutral decor! 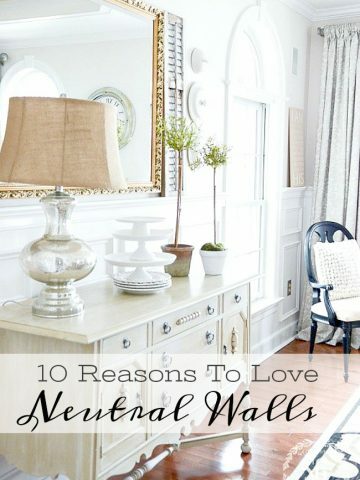 My best tip when thinking about neutral of hues is to either make your room mostly cool neutral hues or warm. A little bit of both in a room won’t hurt but you should definitely pick either cool or warm! As you can probably tell I like warm neutral hues… with a little cool thrown in. Size becomes important in a neutral room. It’s okay to bring in a big piece that may be a little out of scale. I think big trappings in a neutral room adds a whole lot of much needed design significance. A large hutch or bookcase looks great in a neutral room. Or how about a big, oversized vase of flowers! Who doesn’t love a big pop of color in a neutral room! It just seems to bring a room to life! When adding a color to a neutral room, use it in several decor elements around the room OR en mass in one great and fabulous piece. 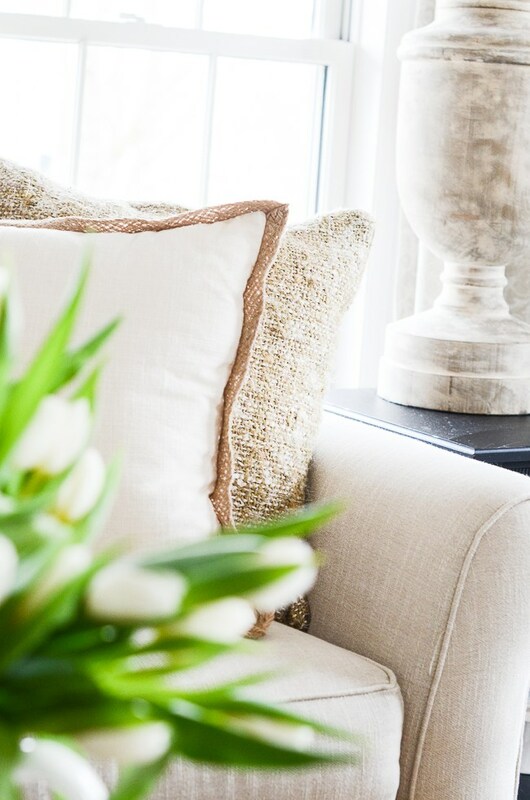 With these 6 easy tips under your decor belt, you are well on your way to decorating with whites and neutrals and doing it not just right but fabulously!!! It looks like your trim is painted white. What color are your walls painted? Hi Veronica, the walls are painted Sonnett by Benjamin Moore. I love this easy to live with color. Great information! I am hesitant to add contrasting textures but will try a splash of black in my neutral room. Might be just what it needs to liven it up. Thanks and have a great week! Thank you for always sharing wonderful tips to keeping your home beautiful and comfortable. I love it all. God bless you and your family! Hello just joined your newsletter. Its great to see someone else lives and breathes home and decor. I thought i was an oddball. Look forward to more ideas. Thanks, god bless? Oh, no Julia! There are tons of us here at StoneGable! Who is the artist that did the painting above your couch? The painting is gorgeous! Thanks, Yvonne, for another great post! You are always so helpful! We appreciate all the work you do for us! Blessings! Thank you for pointing me in the right direction. I’d never considered warm or cool neutrals. I now get it why some go together and some neutrals clash. What a great tip. Hope to add more texture to my chairs and sofa. Thank you again for great tips!! I love the contrast of the wall color in your neutral room. Would you share the name of the paint, brand, and type (semi, flat, etc). Thank you so much. You are an inspiration to me. Hi Patricia, you can see the colors here: http://www.stonegableblog.com/reasons-love-stonegable-color-palette/. My walls are flat and the trim semi gloss. 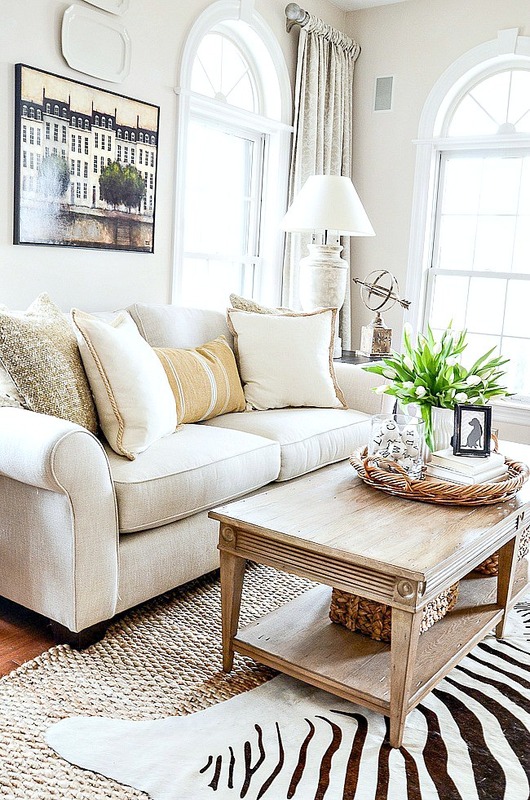 I love neutral colors and design my spaces the same way. I use pillows and accessories to add that pop of color to any room. I would LOVE to know where you purchased the daisy pillow in your photograph! It’s just lovely!!! Hi Susan, I had the pillows made after falling in love with the fabric. I’m a lover of a neutral space. I want that calm effect it gives one when they enter their home. Thank you for all the hints to keep our space from becoming boring. Something we never want to be ? 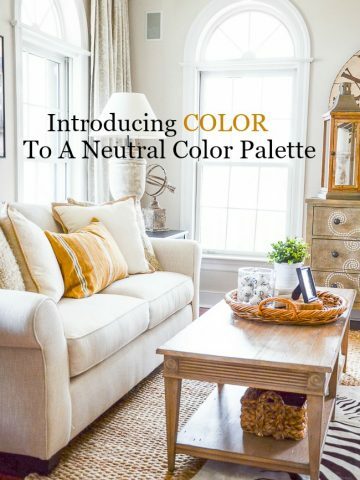 What is the paint color in your living room? Thank you. Hi Yvonne, I love deep, warm colors (living room is dark reds and golds; kitchen is terra cotta and black; sunroom is mustard yellow with shades of orange and sage green) but our house hasn’t seen a major overhaul since we moved in 17 years ago. I love the looks of your house, but no way I can afford (and don’t want) to scrap everything and start over. We have numerous pieces of mostly oak wood antiques in nearly every room that will never be painted or sold. I feel like if I change all the wall colors to white and get new light colored upholstered furniture and accents, it’s going to look very disjointed and not cohesive. Help! What would you suggest as the top 2-3 things to do to get started changing up things? Monica, I agree with you about not wanting to scrap everything. However, I would paint all your rooms the same color to bring some flow and cohesiveness to your home. May I suggest Benjamin Moore’s Sonnet? It would look great! Then I would get a neutral sofa. That should work amazingly with oak antiques. And you might think of editing out colorful pieces that you could stand to let go. Let your rooms breathe a bit. Then if you like it you might think about selling those pieces and make a little cash for more decor renovations. Hope this helps. If all else fails I offer reasonably price interior design consults. Just email me for a list of what I offer. Thanks for your advice Yvonne. I’m eager for a fresh and cohesive look! I am slowly going neutral in my home with touches of sage and black.I use paint and spray paint to repurpose items I would normally get rid of.Love your room with the different patterns and textures. 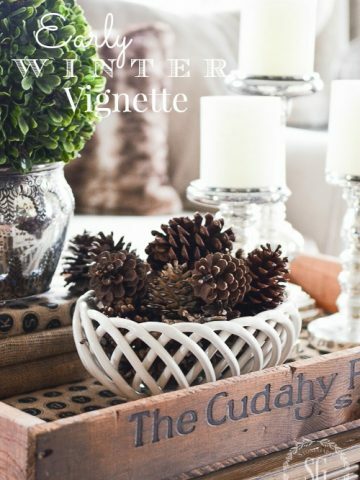 I love neutrals and your decor tips are quite helpful. You have more guts than me cause I would have a hard time putting down the zebra stripe! As always, thanks for sharing great tips! Your living room looks so fresh and inviting. I love how you’ve used little pops of color here and there. Thanks for the great tips! I know I have heard you say all this before, but a refresher is GOOD! Every time I hear/ learn something new. Thanks! PLEASE explain actual colors of paint to give us the warm/cool shades of neutrals. What works on walls, trim and what colors WORK TOGETHER, is the biggie. I can’t be trusted to select the correct shades/colors. HELP!!!!!!!!!!!!!!!!!!!!!!!!!!!!!!!!!!!!! Nan, there are so many different paints that I would not know where to start. The best thing to do is to go to your favorite paint store and have someone show you. And it’s fun! I like your living room a lot and your color scheme. 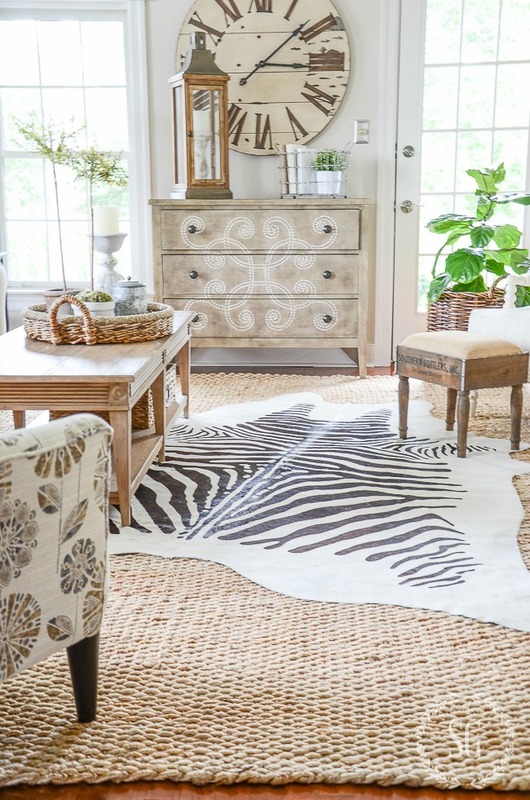 The only thing I’m not sure about is the zebra rug. Btw, you always have fabulous pillows! 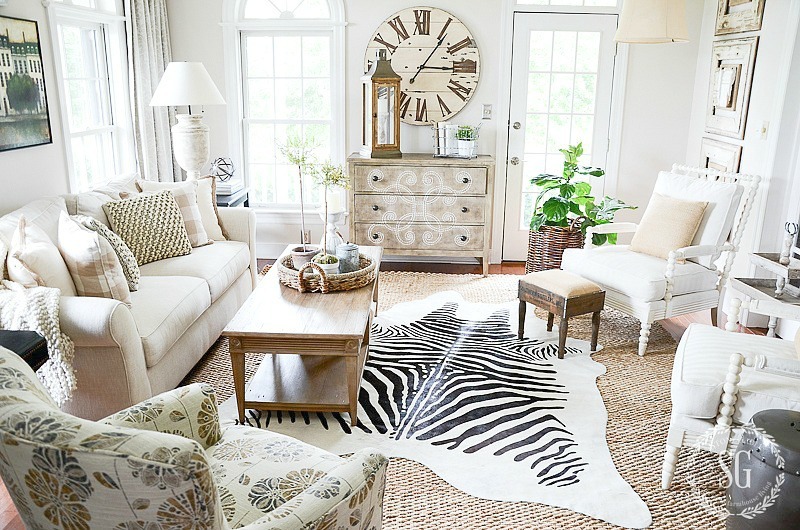 The zebra rug is a signature StoneGable piece. It’s not for everyone.